It's a Clemson tradition for fans to wear orange on every Friday to show unified support for Clemson. And along with the existing Clemson tradition, the annual College Colors Day celebration is slotted this year for September 4th - our first football game weekend. It was organized by The Collegiate Licensing Company (CLC), the NCAA, and its consortium of colleges and universities. So all of us Clemson Girls need to wear orange in two weeks... which begs the question for us working Clemson Girls - what to wear? Most of our gameday attire isn't exactly work appropriate - so I scoured the Web looking for some classy, yet comfortable, orange apparel that would identify you as a Clemson fan and still allow you to blend in your professional environment. Whether your company dresses business casual or in suits, you can easily piece these items with your existing work attire. Button Ups & Blouses - These two blouses would work great with brown or khaki pants or skirts. 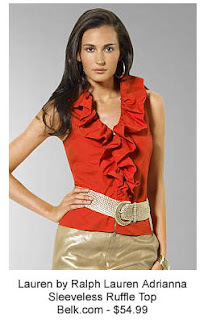 The sleeveless ruffle blouse would look great paired with a blazer, or for the more casual work environment, a dark jean jacket - minus the gold belt and gold pants in the picture, wow. 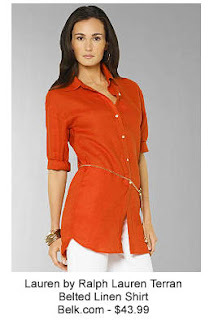 And the tunic blouse looks like it would be versatile enough to pair with almost anything in your work wardrobe. Skirts - Whether you pair these skirts with sandals, heels, or knee high boots and brown tights, these would be great additions to your Fall work wardrobe. 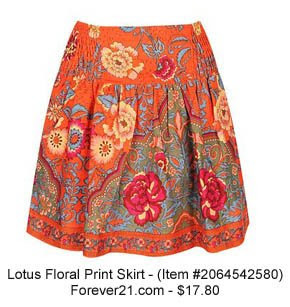 The floral, paisley patterned skirt is a little wild, but you could tone it down with a simple neautral colored blouse or sweater. Or pair it with a dark brown sweater and brown knee high boots when it gets cooler. And who doesn't appreciate the comfort of smocked waistbands that can easily be hidden by a long sweater? 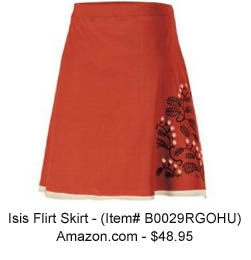 The second skirt is a darker shade of orange (but orange nonetheless), and would be adorable for work with a crisp, white button up (tucked in) or a brown sweater, and brown, suede knee high boots. Orange Work Dress - This dress pictured below is a darker shade of orange, but would be great for the more casual work environment paired with tan or brown sandals. For the dressier workplace, pair this dress with a fitted brown blazer (if needed) and brown knee high boots or tan pumps. I love the rouching on this dress and it looks like it would be very comfortable - and you can't really beat that price for a nice work dress that you'll get plenty of wear out of. 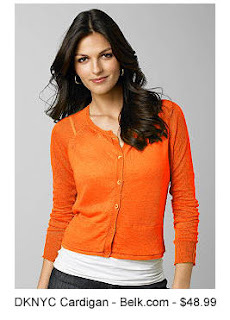 Orange Cardigan - You can't go wrong with this great orange cardigan sweater that can be paired with pretty much anything you already own. Not only is the price extremely reasonable for what you get, but you could definitely wear this sweater to any Clemson sporting event - so it's not limited to just your work wardrobe. 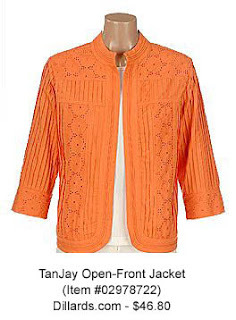 Orange Jacket - I love this embroidered eyelet jacket. You can dress this up (think khaki dress pants and white blouse) or dress it down (think white t-shirt and jeans). You could even wear this over a dress. Again, as an added bonus to the great price, this would be perfect for a late October football game paired with jeans and dressed up with silver Clemson jewelry. Don't be surprised if you see me wearing this to the Clemson vs. FSU home game with my skinny jeans and brown, suede knee high boots. 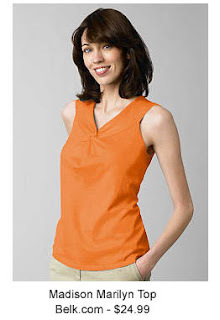 Orange layering tanks - Finally, it's easy enough to show your spirit by simply wearing an orange tank or cami and pairing it up with your existing work wardrobe. The two tanks pictured below would be perfectly matched under your blazers, cardigans, v-neck sweaters, or even under a basic, white button up blouse. And yet again - these tops are versatile enough to be worn alone with shorts, skirts, or jeans for any Clemson sporting event. I love the detail on the top on the left, and the top on the right is so simple you could pair it with practically anything. So tell us what you wear on Solid Orange Fridays - comment on this blog or email us pictures. What do you think about the choices above? Thanks! Love it! I have a few orange sweaters but definitely need some skirts/tanks. May try the orange skirts and dress with khaki jackets now and tan heels, then with brown boots later!